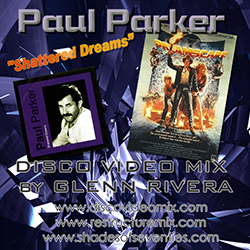 Paul Parker is a dance music artists who hit the scene with 80s electronic master Patrick Cowley – both creating a new excitement with the disco beat and energy soon to be delivering a blow once again to clubs. His big debut single “Right On Target” is the masterpiece of 80s dance music and represents resurgence from the San Francisco Bay area where disco music never rested or ceased. His dedication to move hearts and feet on the dance floor lasts even today. From 2013 his collaboration with UK high energy producer Ian Anthony Stephens is a Euro-house cover of the 1987 track from Johnny Hates Jazz – “Shattered Dreams”. I have taken the song and blended it with the sci-fi thriller “Dreamscape” starring Dennis Quaid – a dream world tale of psychics traveling into troubled individuals dreams to assist in healing. The romantic edge of the film works with the theme of heartbreak and troubled hearts. Featuring scenes from “Dreamscape” – RENT THE DVD!